﻿National Best Friend Day: Calendar, History, Tweets, Facts, Quotes & Activities. 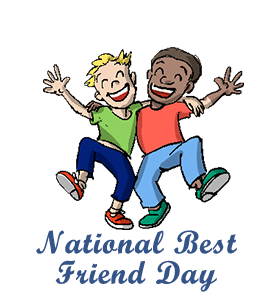 National Best Friend Day seeks to celebrate best friends and the contribution that best friends make in our daily lives. A best friend is a friend that you consider closest to you. It is a person that you can always rely on, someone genuine, trustworthy and who accepts you for who you are. National Best Friend Day is an unofficial holiday that is celebrated annually on the 8th of June. According to statista.com, a 2013 study in the U.S. showed that loyalty is the most valued quality in a close friend. According to anthropologist Robin Dunbar of the University of Oxford, anytime a new close friend or lover enters into your life, it displaces two others in your close circle, typically a family member or friend. According to Matthew Brashears from Cornell University, most people today only have two close friends. According to anthropologist Robin Dunbar of the University of Oxford, humans can only maintain up to 150 significant relationships at the same time. This study, however, was conducted in 1993, and today with social media, it is widely believed that more friendships can now be maintained at the same time. My best friend is the man who in wishing me well wishes it for my sake. – Aristotle, world-renowned Greek philosopher and scientist. I would rather walk with a friend in the dark, than alone in the light. – Helen Keller, famous deaf and blind author, political activist and lecturer. Watch a movie with your best friend about the importance of best friends. Some suggestions are: Best Friends (1982), Bring it On (2000), Mean Girls (2004), and The Help (2011). Spread awareness about the holiday using the hashtags #nationalbestfriendday, #NBF, #bff and #besties. Have a picnic in the park with your best friend. This can be at a park or in any open space so you can both enjoy the great weather. Make a collage of you and your best friend using pictures of the two of you over the years. Share the collage on social media. If your best friend no longer lives close to you, pick up the phone and give him/her a call. Wish your bestie a happy National Best Friend Day and catch up on things going on in your lives.